As soon as I saw the announcement for this year’s sour beer release at Arbor Brewing Company, I Facebooked (gah! Is that a verb now??) my pal and ABC co-owner, Rene Greff, and asked her to please set aside tickets for me. Rene rocks and she did and I paid over the phone and there you go and it was awesome and and and. Yeah, really, I canz write a sentencez!1!!11! Sorry, got a little excited about the sour beers. Let me start by saying that for me, learning to enjoy sour beers was a journey. I tend to be one of those “destination” people–that is, I want to know what I need to know and don’t necessarily enjoy the learning process. (I enjoy the *teaching* process but I’m often inpatient with myself and want to just “get ‘er done”, as the kids say). 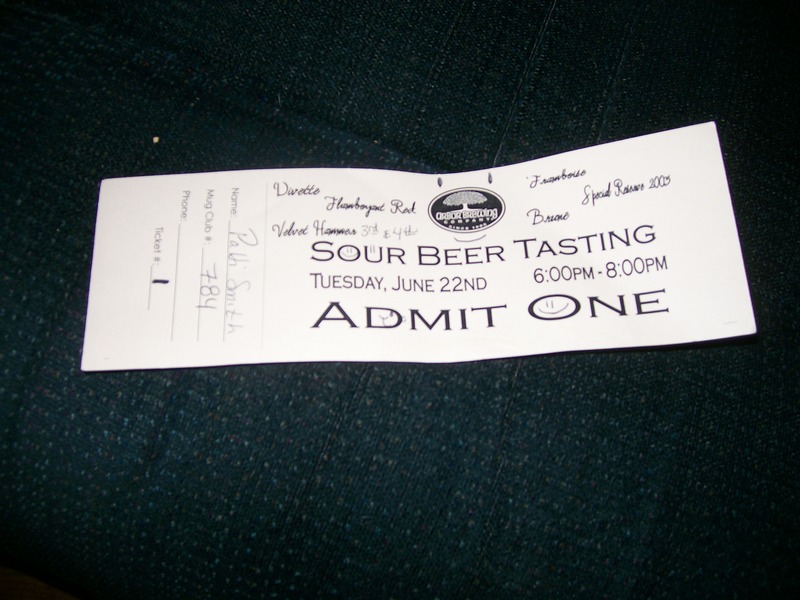 The first time that I tried sour beer was at an Ann Arbor Brewers Guild meeting. I couldn’t get beyond the “sour” taste and didn’t enjoy it that much. Then Jolly Pumpkin beckoned and I tried it again. I still had a hard time with the “sour”, but I genuinely liked the underlying taste of the beer. As I drank more Jolly Pumpkin, my palate got used to the sour taste and eventually began to enjoy it immensely. It was a long haul but ultimately worth it. On Tuesday, June 22, Jeff & I went to the Arbor Brewing Company, had dinner (I got my usual black bean tacos) and then walked to the next room for the tasting. It was then that I realized that I forgot to bring any paper to take notes on and that my camera’s batteries had passed on (God needed some batteries and He called them Home). I am by profession a public school teacher and therefore I am forced to improvise on a daily basis. (Kid’s glasses broken? Use putty to mend. No pencil sharpener in the room where I am helping the kids? Gnaw off the bark of the pencil. And so on.) During a bathroom visit, I realized that the paper towel would make a lovely notebook and so I took a sizeable chunk of such. I was right–lookie here! (Sorry, couldn’t fix the batteries…I’m not going to chew on the damned things hoping that I will some reinvigorate some juice. I value my life, and my teeth). Just like last year, Rene and Matt put on a nice slide show for us, talking about the Belgian style of beer, esters, yeasts, grains and different style types. My favorite slide, of course, was the one that talked about the different scents and tastes you can pick up from beer. If you didn’t know that some beer can smell like horse, wet blanket, barnyard, goat and “zoo like”, well, you do now. Believe it or not, some of those smells are not as God awful as you might think (some are though). 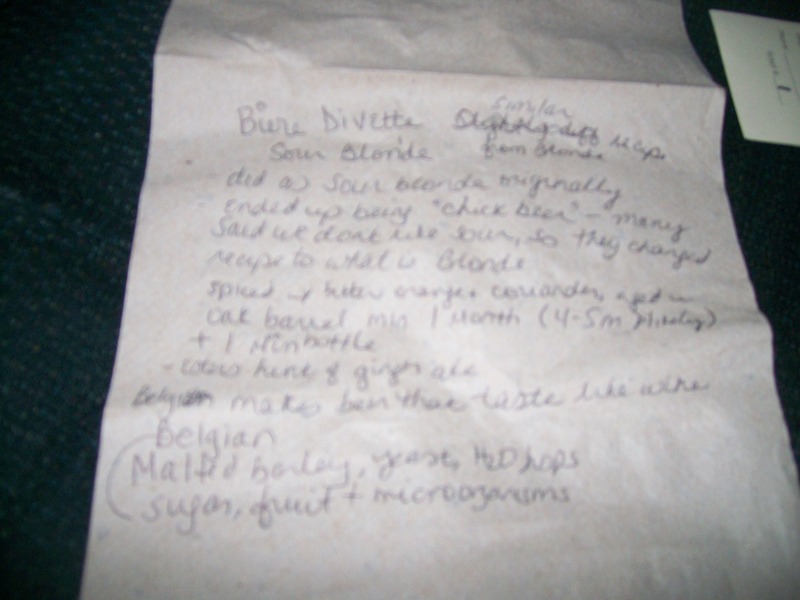 Biere Divette: This recipe is similar to the Blonde that you might be familiar with. The Blonde was originally done as a Sour Blonde and folks loved it, except for that “sour taste”. So, to meet customer demand, they changed it to a regular Blonde. To avoid confusion (i.e. having a Sour Blonde and a Blonde on tap), the name was changed to Biere Divette which is a cool name. This beer is brewed with bitter orange and coriander and aged in an oak barrel for at least one month (more like four or five months, Matt Greff said) and then aged another month (minimum) in the bottle. I found this beer to have a slight ginger ale-y aroma and light sour taste. Since the Blonde is the underlying beer, I was reminded of the famous Brasserie Blonde that the ABC and Corner have, but with that hit of sour that I’ve grown to appreciate. Framboise: Rene told us that Belgium is located between France and Germany (I’m not at all embarrassed to say that I hadn’t known that; geography is the one class that I avoided all during my many years in school) and so they “brew beer that tastes like wine”. They use the traditional malted barley, hops, water, yeast, but they also use sugar, fruit and microorganisms. For Kriek beers, they use cherries, for Peche beers, they use peaches and for Framboise beers, they use raspberries. Be careful though, because some of the mass produced Framboise-style beers use extract. This makes the beer look and taste like raspberry flavored syrup. Yuck. Our friends at ABC, fortunately, use whole raspberries and the taste is stunning. The “base beer” is the aforementioned Divette, so you still get a nice sour blonde taste but with the added bonus of whole, ripe raspberries. The nose of the beer was excellent and it went down very smoothly. At 5.75% ABV, I could have easily drank a whole lot of this beer except that there was more to come. 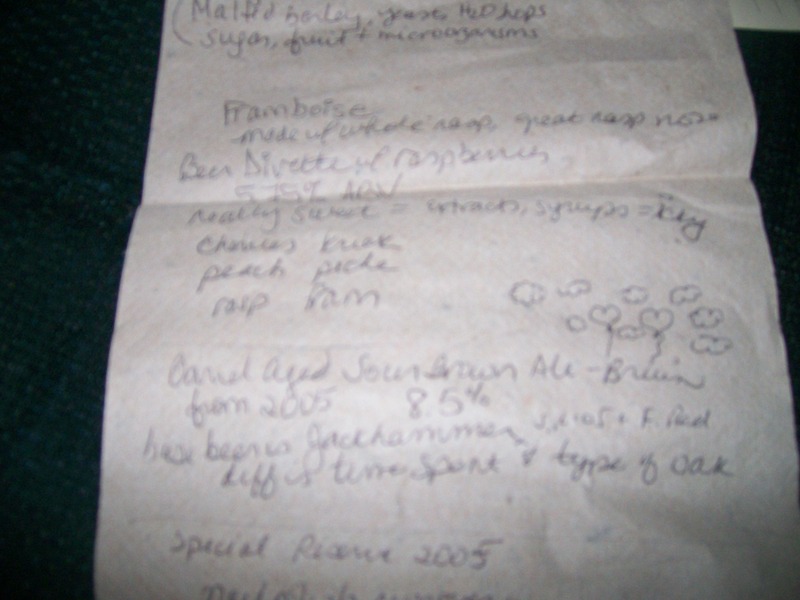 Brune: The next beer was the barrel aged sour brown ale that was made in 2005. It has spent the last four years, patiently hanging out in its oak barrel. The base beer is the Jackhammer which is a great beer on its own; it is remarkable after chillin’ in an oak barrel for five years. This was my absolute favorite beer of the evening–nice balance of sour and Jackhammer goodness. Special Reserve 2005: This beer also began as Jackhammer, and spent its time in a Gueze innoculated oak barrel. Well, waitaminnit, you might be saying. I thought that the Jackhammer was used in the Brune? What’s the difference? Someone asked Matt and Rene that question, and the answer is simple: the difference is the time spent in the barrel and the type of oak barrel that the beer lives in. It’s absolutely amazing to taste the difference. As I said, this was the same base beer as the Brune, but it was in a differently innoculated barrel and spent four years there. To me, it tasted completely different than the Brune. It had a lot of complex flavors and very little carbonation. Here, the low carbonation was a good thing because too much might have masked the flavors, Rene said and she was right. 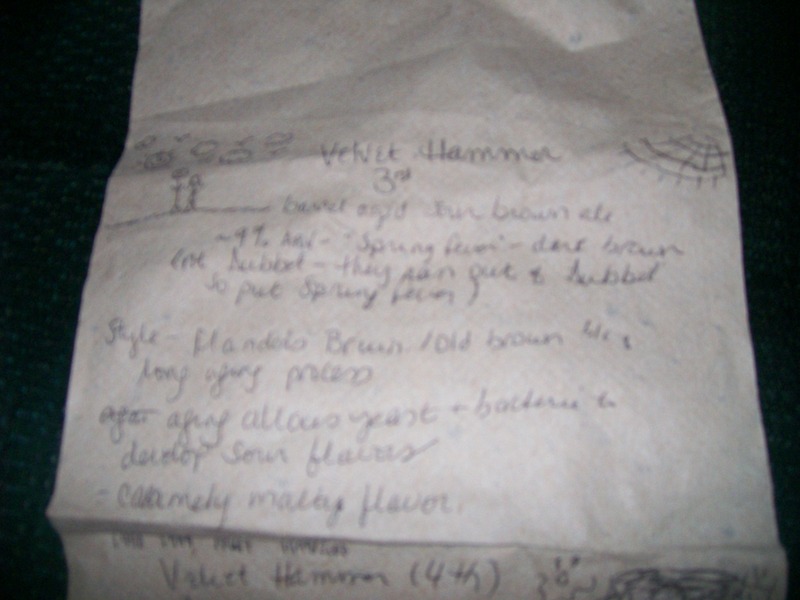 The next beer was the Velvet Hammer (third). This was a barrel aged sour brown ale. The base beer was a small batch that was made a couple of years ago, called Spring Fever. It was about 9% ABV and the style was Flanders Brune/Old Brown Ale. (Originally, they were going to use their Dubbel as the base beer, but they sold out of it too quickly.) The long aging process allowed yeasts and bacteria to develop the sour flavors. I found this beer delicious, with caramely malty flavors nicely co-mingling with the sour. Finally, we had the Flamboyant Red, which is a wild red ale. Again, the Jackhammer is the base beer and again, it tasted and looked different than the other beers for which Jackhammer was the base. This beer was aged in newly innoculated oak barrels back in October. It spent about six months there and then got transferred to bottles where it spent another couple of months. Imagine how excited this beer was to finally get drank! As I said, it had a different taste than its sibling Jackhammer beers, and a lovely red appearance. Along with the Brune, it was my favorite of the night. So the moral of this story is that if sour beers ain’t your thang, don’t sweat it. You’ll get there…start with something like the Divette and work your way to the Special Reserve 2005. Your palate will thank you. Very nice write up! After reading this I’m going to have to go to one of Arbors tastings.. sounds very educational. Now I’m thirsty for a sour beer and it’s only 8AM! !